It's a story so fantastic, heart-warming and brimful of hope it could have been scripted by Disney. 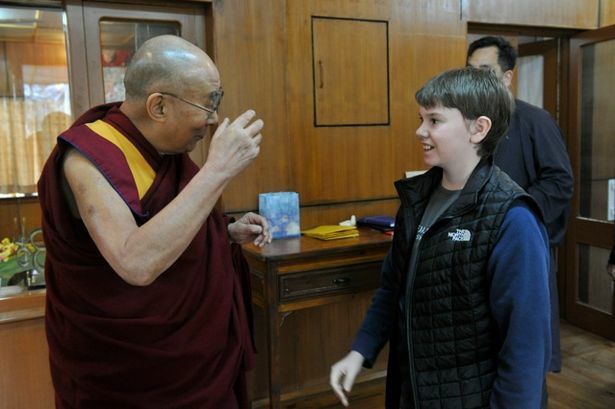 The schoolboy who sent fan mail to the Dalai Lama and received an invitation to meet Tibet’s spiritual leader. Incredibly, 13-year-old George Morris was granted a private audience with the exiled Holy Man in a monastery in Dharamsala, India. After talking about faith, he left the “life-changing” meeting with 18 books and a blessed statue, presented by the Dalai Lama. “Buddhists do not believe in one god,” says the Edgbaston teenager who made the religious journey with dad Andrew. Andrew, a teacher, was equally moved by the meeting. George, a pupil at King Edward VI Five Ways School, is no ordinary youngster. Sharp, perceptive and with an intellect way beyond his years, he searches for spiritual answers and rails against global injustices. He has strong views on poverty when many his age are simply worried about the Premier League title race. Of China’s brutal crackdown on Tibet’s campaign for independence, he says: “There has been a genocide since 1959. Some 1.2 million people have effectively been slaughtered, and 200,000 forced out of Tibet. He converted to Buddhism 18 months ago – “Granny thinks it’s a fad, she thinks I’m a hippy,” he laughs – and wrote a speculative letter to the Dalai Lama last September. To George and his family’s shock, the Dalai Lama replied, inviting him to Dharamsala. George and Andrew began a long journey, punctuated by a three day stop-off in Dubai, the unbridled luxury providing a stark contrast to the poverty they encountered on the Indian sub-continent. They were among 1,500 devotees from 56 nations who gathered at the monastery gates, but George and Andrew were among just a handful to be granted a one-to-one meeting. “I was paranoid about doing something stupid, like not turning my phone off,” says George. And it may not be the last conversation between the unlikely pair. “He said I could call him and ask him anything,” reveals George. Andrew admits to dwelling on more earthly thoughts. Since their return from the two-week trek, George has struggled to find people who believe a tale that seems too tall to be true. Thankfully, he has the photographic evidence. “The usual response is ‘That’s amazing, but did it really happen?’ shrugs George. The meeting has strengthened his faith, and his parents support the path their son has taken. “I thought Buddhism made the most sense,” he explains. “It impacts on my decisions, but it does not impact on my routines. The way that I think about what I do is impacted. The stark contrast between life in oil-rich Dubai and India has only hardened George’s resolve to pursue a legal career centred on civil rights. “I loved India, but hated Dubai,” he admits. “Dubai is a capitalist venture, built solely to get money out of people. It is a hideous place. “In India, at times I felt guilty because I was in a nice, air-conditioned car and I was seeing people begging for water. George publicly thanks King Edward VI Five Ways head teacher, Mrs Y Wilkinson, for allowing him time off to make the incredible journey. She has asked for only one thing in return – the prize pupil has to give an assembly on his meeting with the Dalai Lama. George Morris has the statue and books to prove it.